Freeware clone of one of the most famous video games ever. In Scynse-Man, you navigate the "hero" through several mazes, gobbling all of the pills lying around and avoiding the evil Cigarette Ghosts and their slaves hunting you. However, special power pills allow you to turn the tables and eat the monsters, earning lots of points. To gain even more points you can go for the fruits appearing at random places. Scynse-Man 2 uses a more elaborate engine than its predecessor, the three kinds of monsters actually differ in behavior now, and you get brand-new mazes, of course. Your best performances are stored in the high score list, so you can play again and try to do even better. Alternatively, there is a non-arcade mode that disables scoring and limits the progress lost when you run out of lives. It is possible in both modes to suspend a game in progress. Main part of the game. 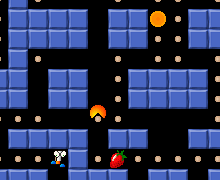 An offshoot of the game, originally intended to be a Web game, consisting of different, smaller mazes.